News It's A Smallworld - Dallahan Are Back! It’s A Smallworld – Dallahan Are Back! They may come from Scotland and be rooted in the traditional music of Caledonia and Ireland, but Dallahan are not content to stay there. 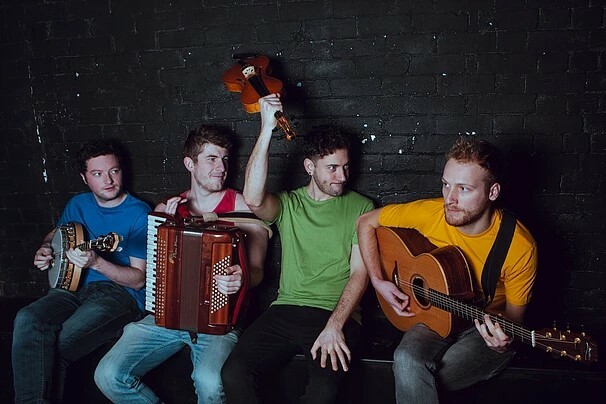 The four piece – who played Priddy in 2017 – love to bring outside influences to their music from as far away as the Balkans and North America to fuse an original sound that is fresh and inspiring, yet is still within the folk tradition. Their mission is to take their audience on a journey, traversing styles and countries of the world in a dazzling live show, creating their own unique brand of World-folk delivered with stunning virtuosity. It is something they certainly achieve. Made up of David Lombardi (fiddle), Ciarán Ryan (banjo, mandolin and fiddle), Jack Badcock (guitar/vocals) and Andrew Waite (accordion) Dallahan have garnered a host of awards, nominations and rave reviews in the five or so years of their existence.